LUKE HOLLANDS is a former lion tamer, motorcycle stunt-rider and ruler of a small South American country. He is also a compulsive liar. He learnt how to tell tall tales while interviewing famous politicians, celebrities and criminals as a newspaper journalist. Thinking he should get a proper job he joined the BBC. 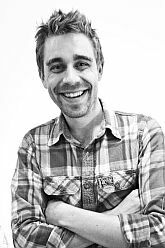 Since then he has produced and presented quirky radio documentaries, appeared in the odd drama and danced on television dressed as a giant bear. He now makes wildlife films, some of which he briefly appears in, and has travelled the world, swimming in shark-infested waters, tramping through crocodile-stuffed lagoons and being eaten alive by various species of nibbling insect. Surprisingly for Luke, everything apart from the first two sentences of this biography is actually true. “... The most engaging thing about this novel is the style and narrative voice. Harker tells his own story as a first-person narrator. His tone throughout is self-assured, even somewhat cavalier, even when faced with dangerous circumstances. This cavalier tone marks Harker as the shining, confident hero, bound to triumph. For example, when involved in a shootout , during a car chase, Harker remarks that, "Despite the fact that someone was trying to kill me, I was rather enjoying myself." This sense that danger is terribly exciting pervades the novel and makes it pleasant to read. This tone also serves to reassure young readers that Harker is bound to come through such difficulty relatively unscathed. Combined with Harker’s self-assured tone, is a marked lack of realism, which also reminds us that Harker will ultimately succeed in getting to the bottom of his mystery. We can actually enjoy the danger that he finds himself in partly because the very nature of the danger and the way that the various villains are presented as caricatures reminds us that Harker is actually not a real child in our mundane world. This lack of realism is almost like a safety net, allowing us to not have to fear for Harker’s safety. Harker’s adventures are a romp through the seedy criminal side of early 20th Century London. Hollands seems to draw on such diverse literary traditions and figures as Conan Doyle’s Sherlock Holmes, E. Nesbit’s adventuring children characters, and Barrie’s Peter Pan, all while maintaining a tone that is unique to Hollands. This tone is sure to appeal to contemporary child readers. “For those who have been crying out for more ‘boy’ books in Middle Grade, here’s one for you. Peregrine Harker is very much a boy’s adventure novel. It’s a fast paced read, focusing on the adventures of the title character as he uses his intrepid journalistic skills to uncover a plot bound up in tea and smuggling. There are chases, rescues, twists, and a pretty satisfying resolution that gives readers the idea that more may be coming from Harker and company. The novel is written in the Victorian/Edwardian style of adventure books. If you’re a fan of steampunk, this should appeal to you as well—there’s some gadgetry going on, not to mention an amazing car (with a sort of driver/butler/bodyguard), and a few steampunkish tropes that pop up to give the book an “out of time” feel. There’s a bit of the penny dreadful in the novel as well, what with a damsel (not usually in distress as she rescues the hero quite often) who is to be married off against her will to some ne’er-do-well who is the sworn enemy of the hero. 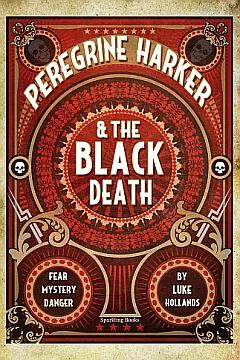 Luke Hollands’ debut Peregrine Harker and the Black Death is a fun adventure set in a time long-past where mysteries were daydreams, and danger a way of life for over-curious detectives. Hollands’ world is explored by his young protagonist, Peregrine, as he strives to uncover the surprisingly intriguing mystery surrounding the sudden shortage of tea. Peregrine isn’t one of those protagonists who immediately comes off as haughty, attractive, and confident--instead, he is rather flawed and easily distracted...No, what I liked was the slow build-up into the main revelation of the story--and it is huge and very satisfyingly unexpected. Though the novel is quite short, Hollands does have a skill for pacing and keeping the reader intrigued as the mysteries mount. “...It is definitely a book for young boys, preferably reluctant readers who like a lot of adventure with chases and a minimal amounts of girls/mushy stuff. “Peregrine is fifteen so he’s really more teen than boy detective, and orphan is a bit misleading. His explorer parents went missing years ago in Peru and for me: no body = no death. It also seems that a taste for action, adventure and danger runs in the family. A lover of Penny Dreadfuls, Peregrine has a hard time reporting on boring subjects, which means he generally turns in fantastical stories his editor cannot publish. He’s given one more chance to redeem himself and is sent to speak to a tea merchant about the sudden rising price of tea due to missing cargo. How will the Empire cope? Not something Peregrine finds exciting enough at all, so when he spies two sketchy characters on the docks, apparently up to no good, he decides to investigate. Unfortunately he’s caught and finds himself locked up in a coffin. The cast of characters is colorful and the author does a great job of introducing the time period without getting too descriptive, which I think is very important in a book geared to younger audiences. “This is an ideal book for readers aged ‘tweens’ and up; it is filled with mystery, action, adventure, thrills, spills and dire peril - and not too long either. Written in the style of a ‘penny dreadful’ and incorporating a satisfying amount of historical detail about the early twentieth century Europe in the process, we meet the brave young detective Peregrine Harker who investigates some mysterious deaths and quickly finds that learning too much about The Brotherhood of the Black Death carries risks and his own life is now in mortal peril. “I loved it! I felt that this book was equal parts Rin Tin Tin (minus the dog), Indiana Jones, The Secret Life of Walter Mitty and Sherlock Holmes all wrapped up in the 15 year old protagonist. This is a book primarily for the male reader, probably ages ten to fifteen. But, that is what gives this book its appeal. It’s a great mix of history and the fantastical, of the dreams of a young boy with a head full of stories and the amazing stories that can actually take place. Our young hero, a young and very green journalist, is dispatched by his editor to examine a story regarding something distinctly British ‒ tea. And yet, when young Harker reaches the crux of his search, we find out that tea is not the root of the problem, but something much more sinister and engrossing. “I know this is a cliche, but bear with me. Start with the Hardy Boys. Or at least with the can do, gee whiz, boy detective vibe. Now put that in 1908 England. Amp up the violence a little by introducing a few bodies, poison and gun-play. Make the plot more twists and turns than just smugglers hiding in a cave. This is a stock sort of character, but there is a good reason why this character keeps popping up. He is the enduring embodiment of adventure, excitement, danger!, action and derring-do. And, everything is improved when you add a romantic interest in the form of a girl with spirit and twinkling eyes, and a pal with a revolver. Once you sprinkle in a range of secondary characters who you may trust, or perhaps not, and a shady society of villains, you’re set. The last piece of the puzzle is the author. Does he have the skill to keep this mix moving forward, to keep all the balls in the air, and to keep you interested in and rooting for the hero. The answer here is "yes". Mr. Hollands doesn’t get cute and he doesn’t reach too far. This is action/adventure and he keeps the wheels turning with writing that doesn’t fail, and that is complemented by some some nice touches and sharp observations that elevate the work beyond mere pulp, (not that I’m faulting mere pulp).